In this week’s study from Tehillim / Psalms 86:1-17, the Psalm opens saying, א לִבְנֵי-קֹרַח מִזְמוֹר שִׁיר יְסוּדָתוֹ בְּהַרְרֵי-קֹדֶשׁ: Of the Sons of Korah. A psalm. A song. 87:1 His foundation is in the holy mountains. (NASB) What does it mean that His foundation is in the holy mountains? The sons of Korach say, ב אֹהֵב יְהֹוָה שַׁעֲרֵי צִיּוֹן מִכֹּל מִשְׁכְּנוֹת יַעֲקֹב: 87:2 The Lord loves the gates of Zion More than all the other dwelling places of Jacob. (NASB) Why does the Lord God in heaven love the gates of Zion more than anywhere else in Israel? What is it about Zion that is so important? The psalmist continues saying, ג נִכְבָּדוֹת מְדֻבָּר בָּךְ עִיר הָאֱלֹהִים סֶלָה: ד אַזְכִּיר | רַהַב וּבָבֶל לְיֹדְעָי הִנֵּה פְלֶשֶׁת וְצוֹר עִם-כּוּשׁ זֶה יֻלַּד-שָׁם: ה וּלֲצִיּוֹן יֵאָמַר אִישׁ וְאִישׁ יֻלַּד-בָּהּ וְהוּא יְכוֹנְנֶהָ עֶלְיוֹן: 87:3 Glorious things are spoken of you, O city of God. Selah. 87:4 ‘I shall mention Rahab and Babylon among those who know Me; Behold, Philistia and Tyre with Ethiopia: ‘This one was born there.’‘ 87:5 But of Zion it shall be said, ‘This one and that one were born in her’; And the Most High Himself will establish her. (NASB) There is a city in Israel that is called the “city of God.” Which city is that and why would the Lord call a city by His Name? The Psalmist writes, ז וְשָׁרִים כְּחֹלְלִים כָּל-מַעְיָנַי בָּךְ: 87:6 The Lord will count when He registers the peoples, ‘This one was born there.’ Selah. (NASB) This suggests the one who seeks the Lord in heaven also counts himself as being numbered with Israel, the Lord sees such a person standing with His people and states such a person was born here.The psalm concludes saying, ו יְהוָה יִסְפֹּר בִּכְתוֹב עַמִּים זֶה יֻלַּד-שָׁם סֶלָה: 87:7 Then those who sing as well as those who play the flutes shall say, ‘All my springs of joy are in you.’ (NASB) Why is the spring of joy inside of a person? In this week’s study from Tehillim / Psalms 86:1-17, the Psalm opens saying, א לִבְנֵי-קֹרַח מִזְמוֹר שִׁיר יְסוּדָתוֹ בְּהַרְרֵי-קֹדֶשׁ: Of the Sons of Korah. A psalm. A song. 87:1 His foundation is in the holy mountains. (NASB) What does it mean that His foundation is in the holy mountains? The MT states, יְסוּדָתוֹ בְּהַרְרֵי-קֹדֶשׁ “His foundation is in the holy mountains.” What are the holy mountains? Rashi says the following, רש”י על תהילים פז, א יסודתי בהררי קדש . יסודת מזמור זה על הר ציון וירושלים יסדו המשורר: “foundation psalm, this is mount Zion and Jerusalem, foundation song.” Rashi believes this is a reference to mount Zion upon which the Temple was built. The Aramaic Targum states, א על ידיהון דבני קרח איתאמר שבח שירתא דמתייסד על פום אבהתא דמן לקדמין׃ 87:1 Uttered by the sons of Korah. A song that was established at the instruction of the fathers of old. (EMC) The rabbis translate the MT in the Targum to say that this is a song that was composed by their fathers (Sons of Korach) from long ago. The Septuagint states, 87:1 τοῖς υἱοῖς Κορε ψαλμὸς ᾠδῆς οἱ θεμέλιοι αὐτοῦ ἐν τοῖς ὄρεσιν τοῖς ἁγίοις A Psalm of a Song for the sons of Core. 87:1 His foundations are in the holy mountains. (LXX) The difficulty in the interpretation is related to “holy mountains” plural, where one might think the holy mountain (singular) may be a reference to Sinai, or to Zion as Rashi states. If this is a reference to Israel and to Jerusalem, we are reminded of what is written in Parashat Beshalach, in the Torah, in Shemot / Exodus 15:17. In Shemot / Exodus 15:17, Moshe writes that the Lord brings His people and plants them in the mountain of His inheritance. The mountain is the place where he has caused Himself to dwell, the sanctuary which the Lord has established. This describes a place the Lord Himself has created, a specific mountain by which He has established (המקום) for His name. The Lord plants us into this mountain, drawing in the imagery that we take part in and are nourished by this holy place. The Mishnah has the following to say concerning the mountain and the possessions of God. The Mishnah describes 5 things that are the possession of God, (i) the Torah, (ii) Heaven and earth, (iii) Abraham, (iv) Israel, and (v) the Sanctuary. It is interesting how the rabbis separate Abraham from Israel. What is the point of separating Abraham as a possession of the Lord? The point is out of all men on earth, Abraham was blessed of God in a particular way. The Lord had drawn him out from his people and made him into a great nation because of his faith and faithfulness to the promises of God. The Mishnah describes the instruction of the Lord (Torah), how He is possessor of all that exists (heaven and earth), and the importance of the place where He has established His name, the Sanctuary. All of these concepts are drawn in to the idea of “His foundations are in the holy mountains.” The Talmud Bavli Megilla 18a states that joy comes to those who are in the house of prayer, which is located at God’s holy mountain. המקום (the Place), the Sanctuary, the offering, prayer, and the Holy mountain of God are drawn together in context and the rabbis say joyful is the one who is in the house of prayer. The idea is such a person is communing with God and at peace. The foundation of God is at the root of His Word, His promises. The Lord is known by His Word and His promises which he keeps to His people. The holy mountains comes back to the Word of God, where the Lord chose המקום (the Place) for His Name to be revealed and to be spread throughout all the earth, which is in Jerusalem. According to the Psalm, the sons of Korach say, ב אֹהֵב יְהֹוָה שַׁעֲרֵי צִיּוֹן מִכֹּל מִשְׁכְּנוֹת יַעֲקֹב: 87:2 The Lord loves the gates of Zion More than all the other dwelling places of Jacob. (NASB) Why does the Lord God in heaven love the gates of Zion more than anywhere else in Israel? What is it about Zion that is so important? The Rabbis ask the same question in the Talmud. The name Zion was used initially in Scripture for the small citadel inside Jerusalem where David placed his throne. Over time, however, the concept of Zion broadened and came to refer to Jerusalem (e.g. Tehillim / Psalm 76:2), or even to the entire nation of Israel (e.g., Isaiah 3:16). When the place of Zion is mentioned in the Scriptures, the precise meaning of the term may vary a bit depending upon the context. Zion is used in the promises of God to establish the Son of David upon the throne of Zion forever (Tehillim / Psalm 89:3-4, 29, 35-37; 132:11-18). The Lord said the following concerning Zion, “For Zion’s sake I will not hold My peace, and for Jerusalem’s sake I will not rest, until her righteousness goes forth as brightness, and her salvation as a lamp that burns.” (Isaiah 62:1) The Lord God Himself is resolved to labor without rest until Jerusalem’s righteousness and salvation shines brightly in the earth. David said in Tehillim / Psalms 48:2 “Beautiful in elevation, the joy of the whole earth, is Mount Zion on the sides of the north, the city of the great King.” The city Jerusalem and Zion have a profound history in the Torah. The first mention of המקום (the Place) Jerusalem in the Torah occurs in Bereshit / Genesis 14, at a time when Lot had been carried captive by invading forces. Abraham and his men pursue the enemy and have a great military victory, Abraham delivered Lot from his captors and brought him safely home. On his return, Melchizedek met Abraham and blessed him. Melchizedek was the king of Jerusalem (Salem) and also the priest of God Most High according to Bereshit / Genesis 14:14-24. The second time המקום (the Place) is mentioned is when Abraham led his son, Isaac, to Mount Moriah, bound him, and placed him on an altar (Bereshit / Genesis 22), this happened on mount Moriah, known as the Akeida (the binding of Isaac). It is interesting to note that Melchizedek was the first priest of God to appear in Scripture, and it was no coincidence that his throne was in Zion. According to the Apostolic Writings, Yeshua the Messiah is declared to be a Priest after the order of Melchizedek (Tehillim / Psalm 110:4). Based upon the NT commentary on Yeshua, He is the heir to the throne of Zion. (see Hebrews 5-7) Zion is connected to King David, and according to the Tanach, David was called of God to function in both a kingly and priestly capacity. This is why we see David putting on a linen ephod at the procession of the ark to Zion (1 Chronicles 15:27). In addition, David was not pretending to be a Levite or to function as a priest as a levite, he was not from the Tribe of Levi. While serving in this priestly capacity, David has shown that the Messiah would serve before God in a similar priesthood. This is why David wrote, “The LORD has sworn and will not relent, ‘You are a priest forever according to the order of Melchizedek’” (Tehillim / Psalm 110:4). David’s zeal for Zion was rooted in his understanding that one day the Messiah would rule in Jerusalem as Priest and King, this is why the psalmist wrote, 87:2 The Lord loves the gates of Zion More than all the other dwelling places of Jacob. (NASB) Jerusalem is a city like none other! It holds the distinction of being the only place on earth God chose as His eternal home (Tehillim / Psalm 132:13-14). This is also the reason history revolves around this city because it is the place of God’s dwelling. Considering this holy place in which the Lord God in heaven makes His name known, and sends forth both his Torah and His Messiah, note the significance the Mishnah places upon the presence and the teaching of God. The psalmist continues saying, ג נִכְבָּדוֹת מְדֻבָּר בָּךְ עִיר הָאֱלֹהִים סֶלָה: ד אַזְכִּיר | רַהַב וּבָבֶל לְיֹדְעָי הִנֵּה פְלֶשֶׁת וְצוֹר עִם-כּוּשׁ זֶה יֻלַּד-שָׁם: ה וּלֲצִיּוֹן יֵאָמַר אִישׁ וְאִישׁ יֻלַּד-בָּהּ וְהוּא יְכוֹנְנֶהָ עֶלְיוֹן: 87:3 Glorious things are spoken of you, O city of God. Selah. 87:4 ‘I shall mention Rahab and Babylon among those who know Me; Behold, Philistia and Tyre with Ethiopia: ‘This one was born there.’‘ 87:5 But of Zion it shall be said, ‘This one and that one were born in her’; And the Most High Himself will establish her. (NASB) According to the Psalm, there is a city in Israel that is called the “city of God.” Which city is that and why would the Lord call a city by His Name? The Tanach and the Apostolic Writings contain many reference to Jerusalem being called “the City of our God” (e.g. Tehillim / Psalms 48:1, 8). Jerusalem the city of Zion, is God’s city because He has invested His name there (Daniel 9:19). Daniel describes Jerusalem as “Your” (God’s) city, praying for the Lord to forgive her iniquity and sin. He connects Jerusalem with המקום (the Place) of His sanctuary. Daniel says the city of Jerusalem is called by God’s name, where both the people and the city are called by God’s name. It is interesting what the Mishnah Sanhedrin 10:2 states about Jerusalem. The Mishnah speaks of prayer causing the Lord to bring a person back to Jerusalem, which is paralleled to the Lord bringing one back into his kingdom, but prayer alone does not cause the Lord to raise a person to live in the Olam Haba (World to Come). Jerusalem appears to be the center and place of the kingdom of God. References to the city of Jerusalem appear throughout the Tanakh and through the ages it has been called by the names, Salem, Mount Moriah, Adonai Urah, Jebus, Jerusalem, Zion, the City of David, and Ariel (Lion of God). The Lord has declared that this is the place where He will establish His Name and will dwell there forever (1 Kings 9.3). It is interesting that at the end of the Apostolic Writings, in the book of Revelation, the center of worship and the throne of God is found in the New Jerusalem, which descends from heaven to Israel. In fact, the 12 gates entering into the city are named by the 12 tribes of Israel. Our understanding of the Lord and who He is, Israel is central to our service to the Lord, we are said to be grafted into Israel, etc. It’s clear that Jerusalem has played, and will continue to play, an important part in the Lord’s deliverance of this world, and in the new world (Olam Haba) which is to come. Should we not seek God’s guidance and direction concerning how we should support Israel, His Holy City, and our involvement with the nation and its people? This is the way things will be in the Olam Haba according to the Apostolic Writings. The point is the church does not replace Israel! Note how the psalmist states, ד אַזְכִּיר | רַהַב וּבָבֶל לְיֹדְעָי הִנֵּה פְלֶשֶׁת וְצוֹר עִם-כּוּשׁ זֶה יֻלַּד-שָׁם: ה וּלֲצִיּוֹן יֵאָמַר אִישׁ וְאִישׁ יֻלַּד-בָּהּ וְהוּא יְכוֹנְנֶהָ עֶלְיוֹן: 87:4 ‘I shall mention Rahab and Babylon among those who know Me; Behold, Philistia and Tyre with Ethiopia: ‘This one was born there.’‘ 87:5 But of Zion it shall be said, ‘This one and that one were born in her’; And the Most High Himself will establish her. (NASB) It is interesting how Rahab the prostitute is connected to Babylon as knowing the Lord Almighty. Rahab believed by faith that Israel was coming and God would destroy Jericho. She put her faith into action by hiding the spies and saving their lives. The psalmist also states Philistia, Tyre, and Ethiopia were born in Israel? The point maybe that the Lord is working to draw all nations to Himself. Egypt in the south, being a world power at one time, the same with Babylon in the north. Philistia is a reference to a people that harassed Israel for centuries, and Tyre which represents the pride of life. Ethiopia may represent a more distant nation, each of these nations, and all of the world will one day recognize the Lord as God of all. The psalmist states that the Lord will establish the one who was born in Zion. This obviously is not a reference to these pagan nations, but is a reference to something or someone else. The Aramaic Targum states, ד אדכרו דכרין תושבחתך מצראי ובבלאי לידעי יתך הא פלישתאי וצוראי עם כושאי דין מליך איתרבא תמן׃ ה ולציון יתאמר דוד מלכא ושלמה בריה איתרבא בגוה ואלהא הוא ישכללינה לעילא לעלמין׃ 87:4 The Egyptians and Babylonians have reminded those who know you of your praises; behold, the Philistines and Tyrians, with the Ethiopians; this king was brought up there. 87:5 And of Zion it will be said, “King David and Solomon his son were brought up within it; and God shall build it above.” (EMC) The Septuagint states, 87:4 μνησθήσομαι Ρααβ καὶ Βαβυλῶνος τοῖς γινώσκουσίν με καὶ ἰδοὺ ἀλλόφυλοι καὶ Τύρος καὶ λαὸς Αἰθιόπων οὗτοι ἐγενήθησαν ἐκεῖ 87:5 μήτηρ Σιων ἐρεῖ ἄνθρωπος καὶ ἄνθρωπος ἐγενήθη ἐν αὐτῇ καὶ αὐτὸς ἐθεμελίωσεν αὐτὴν ὁ ὕψιστος 87:4 I will make mention of Raab and Babylon to them that know me: behold also the Philistines, and Tyre, and the people of the Ethiopians: these were born there. 87:5 A man shall say, Zion is my mother; and such a man was born in her; and the Highest himself has founded her. (LXX) Notice how the rabbis say Egypt and Babylon know the praises of the Lord. The praises of the Lord are found within His might and power to deliver His people, and the fulfillment of His promises. The Targum translates the MT saying that the one who was born and the one who bore him, and the one whom the Lord establishes, is a reference to King David and Solomon His son. The Septuagint has an interesting interpretation on the MT saying, 87:5 A man shall say, Zion is my mother; and such a man was born in her; and the Highest himself has founded her. (LXX) This translation seems to suggest the one who joins himself to the Lord saying that Zion is his mother, such a man was born in her. This interpretation is interesting how a man who calls Zion his mother is as if he had been born of her, born in that place. Rightly so, such a man who seeks the Lord God in heaven will the Lord establish because such a man is walking in God’s ways. The rabbis say the following regarding being born במקום (in the place). The description of Israel as “the good ones,” has a dual meaning. A) There will always be found some good people in Israel, people whose merit will suffice to insure the nation’s survival, people such as the prophets whose very existence has made our people unparalleled among all the nations since Abraham. Psalms 87:5-6 clearly reflects this sentiment. Akeidat Yitzchak describes the one who is born of Zion, “the good ones” as some people whose merits sustain the nations survival, and the prophets whom the Lord sends to call the people back to Him. Ein Yaakov states that this is related to both the one who was born in it, and to the one who looks forward to and hopes for the restoration of המקום (the Place), the promise belongs to both kinds of people. Based upon the rabbinic translations of the Psalm (Targum, Septuagint), and the rabbinic commentary, the psalm appears to describe a transformation of the person who seeks the Lord and seeks to join himself with God’s people. Note when one joins himself with the people of God, his live changes, the old life passes away, and new life comes, he stops living in the way that he did before and is transformed, and walks in God’s Instruction. Note also what the psalmist writes in Tehillim / Psalms 87:6, ז וְשָׁרִים כְּחֹלְלִים כָּל-מַעְיָנַי בָּךְ: 87:6 The Lord will count when He registers the peoples, ‘This one was born there.’ Selah. (NASB) This suggests that one is present, or that the one who looks forward to the building of the Temple, and says that Zion is his mother, counts himself as one among the children of Israel, and so the Lord God in heaven counts him as one who was born there. These Scriptures agree with the Apostolic Writings and interpretation on the non-Jewish person who seeks the Lord God in heaven and does so by joining himself with Israel in the Messiah Yeshua. (see Romans 11) The Aramaic Targum states, ו יהוה על סיפרא די מכתבין ביה חושבן כל עלמיא דין מליך איתרבא איתברא תמן לעלמין׃ 87:6 O Lord, in the book in which they write the account of all the ages [it is written], “This king was brought up there forever.” (EMC) Note how the rabbis translate the MT to say that men of all ages are accounted for. The Torah describes the age of a man who is to be counted, which was a reference to military service and the strength of the armies of Israel. Here however, we find the one who joins himself with Israel by looking to Zion, looking to המקום (the Place), and seeks to walk in God’s ways, even his family is numbered, because his children will grow to know the Lord as a result of his faithful walk before the Lord. The Septuagint states, 87:6 κύριος διηγήσεται ἐν γραφῇ λαῶν καὶ ἀρχόντων τούτων τῶν γεγενημένων ἐν αὐτῇ διάψαλμα 87:6 The Lord shall recount it in the writing of the people, and of these princes that were born in her. (LXX) So these men who look to Zion will be raised up by the Lord to leadership positions as it says in Tehillim / Psalms 87:6, princes that were born in her. The psalm concludes saying, ו יְהוָה יִסְפֹּר בִּכְתוֹב עַמִּים זֶה יֻלַּד-שָׁם סֶלָה: 87:7 Then those who sing as well as those who play the flutes shall say, ‘All my springs of joy are in you.’ (NASB) What is a spring of joy? Why is the spring of joy inside of a person? The Aramaic Targum states, ז ואמרי שירין על חינגיא כל מיני תושבחן על קורבנא מתאמרין בגווך׃ 87:7 And they utter songs with celebration – all kinds of psalms with sacrifice are uttered in your midst. (EMC) The Septuagint states, 87:7 ὡς εὐφραινομένων πάντων ἡ κατοικία ἐν σοί 87:7 The dwelling of all within thee is as the dwelling of those that rejoice. (LXX) This may be related to what the Lord told Israel in Shemot / Exodus 25, to make a מִקְדָּשׁ (Mikdash) and a הַמִּשְׁכָּן (Mishkhan). The rabbis say in the commentary Shney Luchot HaBrit, Shmini, Torah Ohr 17 the following. Man is composed of body and soul, a visible as well as an invisible part. This is the deeper meaning of Exodus 25,8: ועשו לי מקדש ושכנתי בתוכם, “They shall make for Me a Sanctuary and I shall dwell amongst them.” The difficulty here is that the verse speaks about the Tabernacle. Our Rabbis in Shavuot 16 tell us that the expression Tabernacle and Sanctuary may be used interchangeably. This was not the only difficulty in the verse. Why, if the Sanctuary is a single unit, does the Torah report G’d saying that He will dwell amongst them (pl)? The Torah should have written בתוכו! We have here an allusion to the fact that the cause is fond of the effect, i.e. the hidden longs for the revealed. Our sages (Pessachim 112) articulated this thought when they said that more than the calf desires to suckle on the teats of its mother, the cow is anxious to nurse its calf. In פרשת ויקהל 36,1 the Torah writes: אשר נתן ה’ חכמה ותבונה בהמה, “whom G’d had given wisdom and insight.” Shemot Rabbah 48,3 states that the word ba-heymah in the above verse is to teach us that it was not only man whom G’d imbued with wisdom but also the animals. Betzalel was the only one who was privy to the wisdom possessed by the animals. Perhaps the Torah wants to hint at the proverb we quoted earlier that the mother cow is more anxious to nurse its calf than the calf is anxious to be nursed. It is all an allusion to the close connection between cause and effect. We are taught a lesson in reciprocal attachment and unity, i.e. that nothing exists outside of G’d Himself, that He is inextricably involved with all that He has created. It is this lesson the Rabbis wanted to teach us when they said that מקדש and משכן can be used interchangeably; the exterior, visible part, is called משכן, whereas the interior, invisible part, is called מקדש. We have a further clear allusion to this relationship between cause and effect, the visible and the invisible, when the Torah describes the way the קרשים, planks of the Tabernacle, were joined together. The Torah (Exodus 26,24) uses the term “תאמם, twins,” when describing the manner in which these planks were joined to each other. When ??? they are described as תמים, perfect. We have here a description of the essence of the Tabernacle, i.e. that it was a microcosm. The way man is created, body and soul, is compared to the meaning of Shemot / Exodus 25:8, מִקְדָּשׁ וְשָׁכַנְתִּי בְּתוֹכָם: 25:8 ‘Let them construct a sanctuary for Me, that I may dwell among them. (NASB) The idea is that the מקדש and משכן may be used interchangeably, where the exterior, visible part, is called משכן, whereas the interior, the invisible part, is called מקדש. Note how significant these comments are if we compare this to the opening comment, that man is composed of body and soul. The body is the visible part, the soul is the invisible part, and there is an interchangeable quality between the body/soul based upon the Torah concept of sanctification, setting apart, making a place for the Lord to dwell, the Lord preparing our hearts in Yeshua the Messiah, and by giving us His Spirit. As a result of these things, we are called to live in the manner that demonstrates the spiritual condition, our hearts have been sanctified, and set apart as a holy place for the Lord to dwell. The way we live our lives effects our soul. If one lives in sin, the soul becomes dark, whereas, if one lives in righteousness, the soul becomes bright and filled with the things of God. These are very rabbinic concepts, and these very same concepts may be found throughout the Apostolic Writings. Let’s Pray! 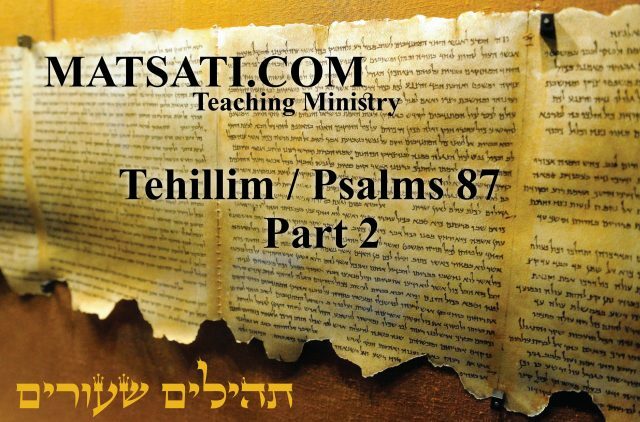 The Rabbinic Commentary (Midrash) on Tehillim / Psalms 87 has 7 parts. Reading through the Midrash we will be looking at Part 1, 3, 5, 6, and 7. Let’s begin by outlining Midrash Tehillim Chapter 87, Parts 1, 3, 5, 6, and 7. The משל (mashal) “the parable,” goes on to explain the פתיחתא (Petihta), the rabbis discuss the idea of the Lord and the foundation of the holy mountains, the gates of Zion, and prayer. The נמשל (Nimshal) “expansion on the parable” expands upon the משל (mashal), the rabbis discuss why bad things happen to the children of Israel if Jerusalem is His foundation? The משל (mashal) “the parable,” goes on to explain the פתיחתא (Petihta), the rabbis discuss the boarders and precious stones in the context of the king messiah. The נמשל (Nimshal) “expansion on the parable” expands upon the משל (mashal), the rabbis expand upon the mashal in the context of the mountain of Sinai and Zion. The משל (mashal) “the parable,” goes on to explain the פתיחתא (Petihta), the rabbis discuss the meaning of the city of God in the context of Hezekiah bringing water into the city of David. The נמשל (Nimshal) “expansion on the parable” expands upon the משל (mashal), the rabbis expand upon the mashal with people being praised because they helped the Lord with His burdenrawing a parallel to studying Torah. The משל (mashal) “the parable,” goes on to explain the פתיחתא (Petihta), the rabbis discuss the meaning of those that acknowledge God in the context of the King Messiah. The נמשל (Nimshal) “expansion on the parable” expands upon the משל (mashal), the rabbis expand upon the mashal with the honor and strength of the Lord. The משל (mashal) “the parable,” goes on to explain the פתיחתא (Petihta), the rabbis discuss the meaning of the Lord counting the man who says Zion is his mother, referring to him as having been born new. The נמשל (Nimshal) “expansion on the parable” expands upon the משל (mashal), the rabbis expand upon the mashal drawing parallels to water, and new songs. א לבני קרח מזמור שיר יסודתו בהררי קדש, אוהב ה׳ שערי ציון מכל משכנות יעקב. אוהב הקב״ה שערים המצויינים בהלכה יותר מכל בתי כנסיות שבעולם. זהו שאמר הכתוב עניה סוערה לא נוחמה (ישעיה נד יא), מתי עניה, אמר ר׳ יצחק בזמן שהייתי עניה ממעשים טובים, מתי סוערה, בזמן שטלטלתי בעולם, כענין שנאמר ויהי סער גדול בים (יונה א ד), לא נוחמה, אמר הקב״ה לישראל אני מייסד אותך, כענין שנאמר ויסדתיך בספירים (ישעיה שם נ״ד), בסנפירונין. [מרביץ בפוך אבניך (שם ישעיהו נ״ד)]. בפוך באבני כוחלא. מעשה באדם אחד שלקח אבן אחת של ספיר, ואמר למוכר על מנת לבדוק, הניחה והיה מכה בפטיש על הסדן, ונחלק הפטיש, ונשבר הסדן, והספיר לא נשבר. 1. A Psalm of the sons of Korach; a song. His foundation is in the holy mountains. The Lord loves the gates of Zion more than all the houses of Jacob (Tehillim / Psalms 87:1-2). The Holy One blessed be He, loves more than all the houses of prayer in the world those gates noted for decisions on Law rendered therein by scholars. Glorious things are spoken of you, O city of God (Tehillim / Psalms 87:3). These words are to be considered in the light of what Scripture says elsewhere, O you poor, tossed with tempest, and not comforted (Isaiah 54:11). When is the city of God poor? Rabbi Isaac said, When the children of Israel are poor in good works. When is the city of God tossed with tempest? When the children of Israel are tossed about in the world (Soarah means tossed with tempest, for its stem has this sense in the verse, There was a mighty tempest (saar) in the sea (Jonah 1:4)). And not comforted, God said to Jerusalem, Though I chastise you in this world, in the time to come, Behold, I will set your stones in fair colors, and lay your foundations with Sapphires (Isaiah 54:11). By fair colors is meant fast colors made of antimony. As for sapphires it is said that a man bought a sapphire and stipulated with the seller that he wished to test it. He laid the sapphire on an anvil and struck it with a hammer, and the hammer split and the anvil broke, but the sapphire was not broken. The Rabbis say, אוהב הקב״ה שערים המצויינים בהלכה יותר מכל בתי כנסיות שבעולם The Holy One blessed be He, loves more than all the houses of prayer in the world those gates noted for decisions on Law rendered therein by scholars. Note what the midrash states, the Lord loves (אוהב) the gates (שערים) of the way halachah (בהלכה). The word “halachah” is translated as “the path that one walks,” where the word is derived from the Hebrew root הלך meaning to go, to walk or to travel. At the heart of halachah is the unchangeable 613 mitzvot (commandments) the Lord God gave to His people, the Torah (the first five books of the Tanach). The significance of these statements is in regard to what the Lord wants for our lives. He desires for us to live in such a way so as to bring honor and glory to His name. But most of all, obedience demonstrates our love for Him and His ways. This is what the Apostle John meant when he said in 1 John 5:3 For this is the love of God, that we keep His commandments; and His commandments are not burdensome. (NASB) Keeping the mitzvot of God is evidence of our love for God; this shows that love is not in word and tongue only, but in deed and in truth; and such persons have a sense of the love of God upon their souls which influences the way they act. The rabbis continue saying glorious things are spoken of the city of God. This is drawn into parallel to a poor man who is tossed to and fro by the wind. Why do you think the rabis draw a parallel to the poor? The midrash states this is related to the people being poor in maasim tovim. Note what Paul tells Timothy in 1 Timothy 6:18 Instruct them to do good, to be rich in good works, to be generous and ready to share (NASB) The Lord is looking for those who are rich in good works and not poor to maasim tovim. In Judaism, tzedakah, a Hebrew term literally means righteousness which is also a word used to signify charity and maasim tovim, refers to the religious obligation to do what is right and just. Note that this is commanded by the Torah and not voluntary. The command to do maasim tovim (good deeds) which are synonymous to acts of charity, are not a Terumah (a voluntary contribution) but a requirement by God. In regard to charity, the financial amount given is voluntary, though Jewish tradition states that one is to take 10 percent of one’s income which is alloted to righteous deeds. The midrash continue saying, When is the city of God tossed with tempest? When the children of Israel are tossed about in the world (Soarah means tossed with tempest, for its stem has this sense in the verse, There was a mighty tempest (saar) in the sea (Jonah 1:4)). The idea of being tossed about to and fro is connected to the lack of righteousness in the life of the people. The purpose is meant to draw a person back to the love of God and to walk in His ways, as opposed to walking in our own ways and receiving the recompense for our sins. Midrash Tehillim 87 Part 1 concludes saying, “Though I chastise you in this world, in the time to come, Behold, I will set your stones in fair colors, and lay your foundations with Sapphires (Isaiah 54:11). By fair colors is meant fast colors made of antimony. As for sapphires it is said that a man bought a sapphire and stipulated with the seller that he wished to test it. He laid the sapphire on an anvil and struck it with a hammer, and the hammer split and the anvil broke, but the sapphire was not broken. ” The midrash seems to be drawing a parallel to good deeds and the Lord establishing precious stones in heaven for those who serve Him in the capacity of doing what is right. Yeshua seemed to be speaking of these things in Matthew 6:16-21. The point is that we should not make a show of our good deeds before others. The Lord, our Father in heaven sees what we are doing, and as the midrash states, the Lord will set up precious stones and lay a foundation with Sapphires which cannot be broken. This indicates that what we have in the Lord is much greater, much more precious than what we have in this world. Midrash Tehillim 87, Part 3 opens with the Dibur Hamathil (דיבור המתחיל) saying, “And all your borders of precious stones (Isaiah 54:12).” The homiletic introduction to the midrash states, “Rabbi Benjamin son of Levi said, In this world, the boundaries of men’s fields are marked with citrus, but in the time to come, All your boarders of precious stones, that is, the boundaries will be marked with gems.” The entire midrash states the following. ג וכל גבולך לאבני חפץ (שם ישעיהו נ״ד). [אמר ר׳ בנימין בר לוי לפי שבעולם הזה הן מתחמין את שדותיהן בחצובות, אבל לעתיד לבוא וכל גבולך לאבני חפץ] של אבנים טובות. אמר ר׳ יודן לעתיד לבוא אדם יש לו שני זהובים [חוב] על חבירו, והוא אומר נלך אצל מלך המשיח, והן הולכין אצלו, והוא אומר לו מה אני חייב לך זהב אזיל מכאן, שהכסף והזהב לפני מלך המשיח כעפר, שנאמר השם גבולך שלום (תהלים קמז יד), אמרו לו בני קרח, אימת דיתעביד כדין, אנו אומרים לך שירים וזמרים, הוי לבני קרח מזמור שיר יסודתו בהררי קדש. דבר אחר יסודתו בהררי קדש. יסודתו של עולם ירושלים, בזכות שני הרים קדושים, הר סיני והר המוריה. אמר ר׳ פנחס בשם ר׳ ראובן עתיד הקב״ה להביא לסיני ולתבור ולכרמל וליתן ירושלים בראשם, שנאמר (והיה ביום ההוא) נכון יהיה הר בית ה׳ בראש ההרים [וגו׳] (ישעיה ב ב), אמר ר׳ חנינא ולא עוד אלא שעתיד להיות מזמר והן עונין אחריו שירים וזמרים, שנאמר וכנניהו שר הלוים [במשא] יסר במשא (דה״א דברי הימים א׳ טו כב). 3. And all your borders of precious stones (Isaiah 54:12). Rabbi Benjamin son of Levi said, In this world, the boundaries of men’s fields are marked with citrus, but in the time to come, All your boarders of precious stones, that is, the boundaries will be marked with gems. Rabbi Yudan said, In the time to come, if a man be owed two gold coins by another, he will say to him, Let us go to the king Messiah. When they come to the King Messiah, the debtor will say, What do I owe you? Is it gold? God to, take it from the dust right here. For in the time to come, gold and silver will be like dust before the king Messiah, as it is said, Your borders will make peace (Tehillim / Psalms 147:14). Hence, the sons of Korach said to God, When You bring such things about, we will sing songs and Psalms to You, Hence A psalm of the sons of Korach; a song, when His foundation will be in the holy mountains. A different comment, His foundation of the world by virtue of two holy mountains, Mount Sinai and Mount Moriah. Rabbi Phinchas said in the name of Rabbi Reuben, There will come a time when the Holy One blessed be He, will bring Sinai, Tabor, and Carmel together, and put Jerusalem on top of them, as is said, The mountain of the Lord’s house will be established in the top of the mountains (Isaiah 2:2). Rabbi Hanina taught, Not only this, but even more. There will come a time when the mountain of the Lord’s house will lead in the singing, and the other mountains will answer in chorus after it with songs and Psalms, for it is said, The Lord will establish it prince of the singers (1 Chronicles 15:22). It is interesting how the rabbis comment that the boundaries of the fields are marked with citrus. Why are the boarders of one’s fields marked with citrus? There may be a number of reasons, the citrus tree may have been planted around the boarders to indicate the location of one’s field making a fence that does not need repairs. Another possibility may be by reason of the way the rabbis connect the citrus fruit to the feast of Tabernacles (etrog) and to the coming of the Messiah. Note here how the rabbis draw the citrus fruit and the boarders of the fields to the Olam Haba (World to Come), each man will be given a portion of land in the World to Come and the boarders will be marked with precious stones. The parallel of the etrog (citron) to the precious gem in the World to Come, illustrates the significance of the Shelosh Regalim in the Olam Hazeh. As God’s children, we are grafted into Israel and are called to take upon ourselves the obedience to the Messiah which is synonymous to being obedient to God’s Torah. The midrash continues with Rabbi Yudan saying, “In the time to come, if a man be owed two gold coins by another, he will say to him, Let us go to the king Messiah. When they come to the King Messiah, the debtor will say, What do I owe you? Is it gold? God to, take it from the dust right here. For in the time to come, gold and silver will be like dust before the king Messiah, as it is said, Your borders will make peace (Tehillim / Psalms 147:14).” Isn’t it interesting how the midrash describes the Olam Haba as a place that even the dust is as pure gold. In the book of revelation, the Apostle John speaks of the holy City of God descending from heaven, the New Jerusalem. Notice the parallel to the midrash by the way John describes the New Jerusalem. The Midrash continues saying, “Hence, the sons of Korach said to God, When You bring such things about, we will sing songs and Psalms to You, Hence A psalm of the sons of Korach; a song, when His foundation will be in the holy mountains. A different comment, His foundation of the world by virtue of two holy mountains, Mount Sinai and Mount Moriah. Rabbi Phinchas said in the name of Rabbi Reuben, There will come a time when the Holy One blessed be He, will bring Sinai, Tabor, and Carmel together, and put Jerusalem on top of them, as is said, The mountain of the Lord’s house will be established in the top of the mountains (Isaiah 2:2).” The singing of praises to the Lord are brought as a result of the Lord working to bring His word to completion for the sake of His people. The praises also come when God’s foundation is in His holy mountains. The rabbis say these are Mount Sinai and Moriah. Another comment says that Sinai, Tabor, and Carmel will be brought together and the Lord’s house will be placed upon it. Why wasn’t mount Moriah mentioned? It is interesting to note that Mount Tabor is an isolated mountain rising abruptly from gently sloping land and is not volcanic and is in proximity to the Nazareth mountains. Scientists consider this a separate geological form. This is the location that is believed to be the transfiguration of the Messiah occurred (Matthew 17). Mount Carmel is said to be covered with vegetation, is covered with caves, and is in a strategic location. These things made Carmel a place for criminals to hide and is described as a place to escape from God implied by the book of Amos (Amos 9:3). Note how Elijah traveled to Carmel and Carmel was the place of Baal worship where Elijah called upon the name of God and the Lord answered in miraculous ways. These mountains, Sinai (Torah), Tabor (set apart, holy), and Carmel (a place of thieves) represent the way of mankind, the Lord bringing all the earth under His authority in the sense that all the nations will come and bow down and acknowledge that He is Lord! Midrash Tehillim 87, Part 3 concludes saying, “Rabbi Hanina taught, Not only this, but even more. There will come a time when the mountain of the Lord’s house will lead in the singing, and the other mountains will answer in chorus after it with songs and Psalms, for it is said, The Lord will establish it prince of the singers (1 Chronicles 15:22).” The Lord’s house is placed upon a mountain, the rabbis say the Lord will work a miracle and bring three mountains together to place His house upon. The joy of the Lord is indicated by the manner in which the Lord is working in the lives of His people. The magnitude of God’s mercy and grace is to forgive us of our sins is reason enough to praise His Holy Name. But not only this, the Lord God also works in our lives to help us to overcome sin, to be victorious, and to bear His testimony for His Glory that we can take His message to all the nations, to describe to the nations the reasons why we should all seek the Lord God in heaven because He is merciful and full of Grace. ה נכבדות מדובר בך. זהו חזקיהו, שנאמר ואשר עשה את הבריכה ואת התעלה ויבא את המים העירה (מ״ב מלכים ב׳ כ כ), הוא חזקיהו סתם מי גיחון, ואומר ויבא את המים העירה, שהוא סודרן, ואינו מדבר אלא בדברי תורה שנמשלו כמים, שנאמר הוי כל צמא לכו למים (ישעיה נה א), ואומר לכו לחמו בלחמי (משלי ט ה), מה היה עושה חזקיה, כד הוי חמי סדרן טב, מייתי ליה לקרתא, תנייה טב מייתי ליה לקרתא, הדא הוא דכתיב גם אלה משלי שלמה אשר העתיקו אנשי חזקיהו (שם משלי כה א). דבר אחר נכבדות מדובר בך. אמר רב הונא אמר רב אידי למה היו ישראל מזכירין את השם במקדש בפירוש, ובמדינה בכינוי, דכתיב ליראה את השם הנכבד והנורא הזה את ה׳ אלהיך (דברים כח נח), הוי נכבדות מדובר בך, ואן מתאמר בקרייתא דאלהא, בקרייתא דציון, ואיכן עיר האלהים סלה. 5. The words, Glorious things are spoken of you, O city of God are taken as said to Jerusalem in the time of Hezekiah. Of him it is told How he made the pool, and the conduit, and brought water into the city of David (2 Kings 20:20). But was it not said of Hezekiah that he stopped the watercourse of Gihon and prevented it from coming into the city of Daivd? Hence, He brought water into the city of David must mean that Hezekiah brought system to the study of Torah; for in this verse, water is plainly a symbol of precepts of Torah, as also in the verses, Ho, every one that thirsts, come yo the waters, etc (Isaiah 55:1), and Come, eat of my bread, and drink of the wine which I have mingled (Mishley / Proverbs 9:5). What Did Hezekiah use to do? Whenever he came upon a man skilled in the systematic arrangement of traditions, he would bring him to the city of Jerusalem. Whenever he came upon a good teacher, he would bring him to the city of Jerusalem. Therefore, it is written, These are the proverbs of Solomon, which the men of Hezekiah king of Judah copied out (Mishley / Proverbs 25:1). In another interpretation, the verse is rendered Glorious things are spoken in you. Rabbi Huna said in the name of rabbi Idi, Why did the children of Israel pronounce the Divine Name, as it is written in the Temple, and only a substitute for the Divine Name in the provinces? Because Scripture says to those in the provinces, You will fear this glorious and awful name, the Lord your God (Devarim / Deuteronomy 28:58). Where, then, according to the verse, Glorious things are spoken in you, is the Divine Name to be spoken? In the city of God, in the city of Zion, as is said at the end of the verse, O city of God. Selah. The midrashic interpretation of glorious things spoken of the Lord in the city of God, and Hezekiah bringing the pool the conduit, and the water into the city, was not a reference to the water, but to Hezekiah systematizing the study of Torah. Water in this sense is symbolic of the precepts of the Torah. This is related to the concepts of hunger and thirst which are natural expressions of the basic human desire and need for food and water. Considering the analogy of water and food, as it is related to God’s word, as opposed to the physical body, one of the clear indicators that something is wrong physically is when we lose our appetite. This is the same spiritually, when considering as the midrash states that water is symbolic of the precepts of Torah. Do you hunger and thirst for God? The Lord made us such that we would hunger and thirst for Him. When there is no hunger for the presence of God, or thirst for His words, this may be an indicator that something is wrong spiritually. As in the case of this physical world, hunger is a basic need for our bodies, and it is possible to acquire a taste for unhealthy things such that when we are hungry we eat unhealthy goods (junk food) which has the effect of dulling the appetite. Similarly, those things that we fill our hearts and minds with, has the capacity to dull the spiritual appetite and have a direct impact on our relationship with the Lord. The rabbis continue in the midrash to say the following, “What Did Hezekiah use to do? Whenever he came upon a man skilled in the systematic arrangement of traditions, he would bring him to the city of Jerusalem. Whenever he came upon a good teacher, he would bring him to the city of Jerusalem. Therefore, it is written, These are the proverbs of Solomon, which the men of Hezekiah king of Judah copied out (Mishley / Proverbs 25:1). In another interpretation, the verse is rendered Glorious things are spoken in you. Rabbi Huna said in the name of rabbi Idi, Why did the children of Israel pronounce the Divine Name, as it is written in the Temple, and only a substitute for the Divine Name in the provinces?” The concepts here are related to Hezekiah bringing in those who were wise into the city of Jerusalem. A secondary interpretation is related to the Divine Name, which was spoken in the Temple, but not elsewhere. The rabbinic interpretation is that the Name of God should not be put to common use so that it will not be profaned. The point of the midrash appears to be related to the manner in which we should be focusing our time, to study God’s Word, and to hallow His Name as opposed to being self seeking and self glorifying. Midrash Tehillim 87, Part 5 concludes saying, “Because Scripture says to those in the provinces, You will fear this glorious and awful name, the Lord your God (Devarim / Deuteronomy 28:58). Where, then, according to the verse, Glorious things are spoken in you, is the Divine Name to be spoken? In the city of God, in the city of Zion, as is said at the end of the verse, O city of God. Selah.” The fear of the Lord is connected to bringing glory and honor to His name by the way we live our lives. Midrash Tehillim 87, Part 6 opens with the Dibur Hamathil (דיבור המתחיל) saying, “I will make mention of Rahab and Babylon as among them that acknowledge Me (Tehillim / Psalms 87:4).” The homiletic introduction to the midrash states, “Rabbi Judah son of Simon taught, The nations of the earth will bring gifts to the King Messiah.” The interpretation of Rahab and Babylon, the nations who acknowledge the Lord God in heaven, appears to be a Messianic expectation according to the rabbis. The midrashic interpretation continues saying, “In the next verse, But of Zion it will be said, This man and that man was brought forth in her (Tehillim / Psalms 87:5), this man and that man refers to the Messiahs of the Lord, to Messiah the son of David, to Messiah the son of Ephraim. By brought forth, it is meant that the Messiahs will be lifted above the nations, as in the verse, Before the mountains were lifted up (Tehillim / Psalms 90:2). And the nations will bring gifts to the King Messiah, as it is said, Gifts (tasuri) from the head of Amana (Song 4:8). Why is a gift called a tesurah? Because when men look at a gift, they sing, as is said, Will not the eye that sees me sing of me (tesureni)? (Job 7:8). And as soon as the nations of the earth come to the King Messiah, he will ask, Are there children of Israel among you? Bring them as gifts to me, as it is said, O you peoples, bring the families unto the Lord (Tehillim / Psalms 96:7), that is, O you nations, bring the families of Israel unto me.” The midrash speaks of two messiahs. Jewish tradition speaks of two redeemers, where each one is called Mashiach. Both are involved in ushering in the Messianic era who are known as Mashiach ben David and Mashiach ben Yossef. (Talmud Bavli Sukah 52b, Zohar I:25b; II:120a, III:153b, 246b and 252a, and Sha’arei Zohar on Sukah 52a) The term Mashiach refers to Mashiach ben David (Mashiach the descendant of David) of the tribe of Judah. He is the final redeemer who shall rule in the Messianic age. Mashiach ben Yossef is of the tribe of Ephraim (son of Joseph), is also referred to as Mashiach ben Ephrayim by the rabbis; he is Mashiach the descendant of Ephraim. He will come first, before the final redeemer, and later will serve as his viceroy. The midrash states that these messiah’s will be lifted up, raised above the nations. The manner in which the rabbis speak of Mashiach is analogous to Yeshua’s words, “As Moses lifted up the serpent in the wilderness, even so must the Son of Man be lifted up;” (John 3:14), and “And I, if I am lifted up from the earth, will draw all men to Myself.” (John 12:32) This is analogous to the Mashiach being lifted high above the nations, and to the nations acknowledging the Lord God in heaven. Can you see the NT parallels between what the rabbis are saying here in the midrash and the teachings of Yeshua and the apostles? Rabbi Akha said, This verse implies that the Messiah will say to the nations of the earth, When you bring the families of Israel to me, bring them not in contempt but in honor, for the words which follow, namely, Bring unto the Lord honor and strength, bring unto the Lord the honor of His name, mean, Bring unto the Lord those who gave honor to God’s name in the world. Rabbi Judah said, some maintain that it was said by Rabbi Berechiah in the name of rabbi Judah, At that time a present (sy) will be brought unto the Lord of hosts, a people scattered (Isaiah 18:7). Be Atbash, sy equals bm, meaning, in their persons. Thus all the nations will bring in the persons of the children of Israel a gift to the King Messiah, that is, they will bring Israel, for it is said, And they will bring all your brethren as a gift unto the Lord out of all nations upon horses, and in chariots, and in covered litters (sabbim), and upon mules, and upon swift beasts, to My holy mountain (Isaiah 66:20). Rabbi Berechiah took this verse to mean that the nations will have young men ride upon horses, that they will have disciples who lack strength ride in chariots, and that they will have women and children ride in covered litters. The word sabbim means covered litters, as in the verse, And they brought their offering before the Lord six covered wagons (sab) (Bamidbar / Numbers 7:3). They will have old men ride upon mules, which walk gently; and as for the oldest among the old men, for those who cannot be carried upon mules, a kind of easy chair will be made for them, in which pillows of fine wool will be laid out, and they will be carried on the shoulders of men of all the nations and will be held up by their hands. What, then, is meant by Glorious things are spoken of you (Tehillim / Psalms 87:3)? It means that the men of all the nations will bring the children of Israel in honor, and that as these men take leave to depart from the King Messiah, they will speak of the glorious ancestry of the children of Israel, saying, This one is a priest, and that one is a Levite, and that other is an Israelite commoner. Why will they speak so? Because the children of Israel, having been sold as slaves, had under the oppression of exile lost trace of their ancestry, had forgotten their identity, and under duress became gentiles. Accordingly, Rabbi Eleazar interpreted, and of them also will I take for priests and for Levites, says the Lord (Isaiah 66:21), as meaning that out of the heathen who will bring Israel to the King Messiah, god will single out any one of priestly, or Levitical, or Israelitish origin, for of them also will I take means that God will take priests and Levites not only out of the children of Israel that are brought, but also out of the nations that bring the children of Israel. The Lord desires for His people to be in the Land of Israel, for the purpose of fulfilling His Word, and His promises. This is why all of Scripture is Israel centric and even in the Olam Haba, we find an Israel centric form of worship and dwelling with God according to the Book of Revelation. That should speak volumes on how we should be living today in Christ the Messiah! In addition to this, the Lord seeks for His people to live obedient lives, and to not live in sin. According to the Apostolic Writings and the rabbinic literature, the Lord God Himself helps us to live for Him. Just as it states in the Torah, Devarim / Deuteronomy 30:6 ‘… the Lord your God will circumcise your heart and the heart of your descendants, to love the Lord your God with all your heart and with all your soul, so that you may live. (NASB) These are all reasons why we should strive to draw near to the Lord God in heaven in the Messiah Yeshua! ז ה׳ יספור בכתוב עמים. מאותן העמים שמביאין את ישראל, שהוא כותב אותם עם ישראל. זה יולד שם, כאיל הם נולדין באותו שעה, הוי זה יולד שם סלה. ושרים כחוללים. אמר ר׳ יהודה בר סימון בשם ר׳ מאיר כשם שהבאר נובע מים חדשים בכל שעה, כך ישראל אומרים שירה חדשה בכל שעה, הדא הוא דכתיב ושרים כחוללים כל מעיני בך. ורבנן אמרו כשם שאמרו האנשים כך אומרות הנשים שירה, שנאמר ושרים כחוללים כל מעיני בך. 7. When in the future the Lord will write up the peoples, He will count this man that he was born there (Tehillim / Psalms 87:6). In the time to come, god will write up certain men of the nations who bring the children of Israel as belonging with Israel. This man that he was born there means that it will be as if such men were newly born there means that it will be as if such men were newly born. Hence, This man that he was born here. As well the singers as the players on the instruments will be there, all my sprints are in You (Tehillim / Psalm 87:7). Rabbi Judah son of Simon said in the name of rabbi Meir, Like the spring from which fresh water pours out at every moment, so will the children of Israel sing a new song at every moment, so will the children of Israel sing a new song at every moment. Of this it is written As well the singers as the players on instruments will be there, all my springs are in You. The Rabbis, however, expounded the verse as meaning that even as the men will sing songs, so also will the women, as it is said, As well the singers as the players on instruments will be there, all my springs are in You. It is interesting how the midrash interprets the Psalm saying “This man that he was born there means that it will be as if such men were newly born there means that it will be as if such men were newly born.” Does this sound similar to what Yeshua was saying to Nicodemus in John 3? Yeshua spoke to Nicodemus of the necessity of being “born again” or “born new,” one would think that he would have thought about the psalm and the meaning of being born new or at least for those who call Zion their mother, it would be said such a person was born here. When Yeshua speaks of being born again, he makes the connection to the spirit, and the one who seeks the Lord, the Lord will circumcise his heart. Notice how Yeshua connects being born of water and of spirit. Being born of water draws a parallel to the mikvah and one having a repentant heart, to be willing to turn from sin, to start new, and to live for the Lord God in heaven. This is connected to the spirit, and how the Lord empowers us to live, by giving us His Spirit, to make a dwelling place in our hearts. The rabbis draw a parallel to being born new to singing songs or joy. What great joy there is in living a repentant life for the Lord, and walking in His ways! Everyone who does so can attest to that! Midrash Tehillim 87, Part 7 concludes saying, “The Rabbis, however, expounded the verse as meaning that even as the men will sing songs, so also will the women, as it is said, As well the singers as the players on instruments will be there, all my springs are in You.” It is important to note that the meaning of men singing songs also includes women. Both men and women will be born new, and based upon the midrashim, this is in context of the Messianic Age. And we know that for each person who places their faith in Yeshua the Messiah, the Lord is fulfilling His word that He spoke so many years ago, that in Abraham seed, all the nations of the earth would be blessed. Hallelujah! Let’s Pray! Parashat Pinchas, Our Tent, Our Bodies, and Sexual Sin.